Well, I guess the holidays are officially over but I have got to say it was fun. All of the riding I did that is, some of the other stuff was not as good. With all of the riding I did I had plenty to write about. On the flip side, with so much riding I didn't have as much time to spend at the keyboard. Or that's my story. Same old excuses, eh? Well, since it's been so long and I rolled so many miles underneath my wheels I'll just have to relive some of the highlights instead of counting down each lovely ride. Before we get into that though, the weather warrants a brief mention. It's been downright weird for December/January here in Maryland. We had a few cold spells and the temps at night are sometimes dipping below freezing, but for the most part the daytime temperatures have been ranging from mild to damn nice. Of course with the warmer weather the precipitation we have comes in the form of rain, not snow and who wants to bike in that. The day after Christmas, because honestly that's as far back as I can remember, Dave K., Stoner and I lit out for the Shed to do some riding and trail maintenance in the form of cutting out some widow maker logs. We had a good solid rain on baby Jesus' birthday that left the rocks nice and slick in some parts. It is truly amazing how the trails up here can take all of this water and remain unfazed. A nice rock foundation will do that for you, but I digress. After riding and sawing out our fair share of logs we hit the Mountaindale overlook, a massive rock pile overlooking the reservoir by the same name. From there we let loose on a narrow, rocky descent that we rarely hit. It is pure fun and adrenaline with loose rocks spiting out from your tires and careful line selection mandatory. About 3/4 of the way down I attempt to ride a small rock slab. I say attempt because once both tires made contact they promptly washed out on the slick surface and I left a nice amount of skin on trail. You see, it was so nice out I was wearing shorts on December 26th. No worries, I laughed it off and finished the downhill and we started climbing our way back to the car. It was a good way to get the holiday rolling. The leg still shows the damage though. 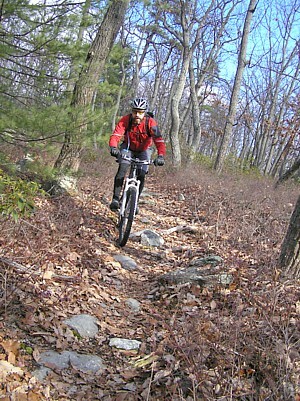 The following day I took my girl up to Michaux State Forest in PA for her first ride in those parts. 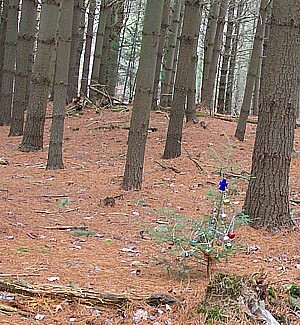 Dave K. joined me again and we hit the route they use for the Dark Hollow race in the Pine Grove section of the forest. It was a bit colder than the previous day and we had snow flurries when we started but that's all it amounted to. The trail there is super sweet, more of the same ridges that make up Gambrill, the Frederick Watershed and the surrounding areas, just further north. After some gnarly downhill stuff you suffer a fairly long climb to get to Big Flat Ridge. That name is somewhat misleading. While it is fairly flat in terms elevation changes the surface is buried rocks with more rocks on top with a little dirt sprinkled in between. Pure technical bliss. We had a blast on this and Julie was making me proud taking it nice and steady and gobbling up the rocks like Ms. Pacman eating pills. After a few miles of this you descend some twisty, technical singletrack that dumps you at a beautiful gorge and reservoir. The wind was howling good so after some quick site seeing we entered back into some very different singletrack: tight, twisty, buff dirt that skirted the water and hardly had any rocks. This is really choice stuff with beautiful views and pine needle laced trail surfaces. With a few miles of that under our belt we hooked on to some gravel forest roads for the return trip back to the cars. By the time I arrived home I was in a race to switch gear, grab the fixed Crosscheck and bolt to Baltimore for ride number 2 of the day. I was heading down to ride with the old Avalon crew for the Hoppy Holidays edition of the Wednesday night ride. We left the usually Park and Ride location of the weekly ride and headed to downtown Baltimore, 7 of us total. We worked our way up to Hampden where we picked up 5 more riders and swung through the light show overload that is the Miracle on 34th Street. From there we headed south to Fell's Point and Max's on Broadway where the beer list is beyond large. As always, with so many good beers on tap it's easy to keep sucking these down long past when you should have stopped. The return trip was pretty uneventful, at least as far as I can remember, it was a crisp, clean night for biking the lonely streets with a few friendly sprints thrown in. Friday I did a mellow ride on the yellow trail at Gambrill and Saturday a couple of us logged 23 miles of rocky goodness at the Shed. Yeah, having off of work was good. Vacation days well spent when you are on the bike. This past week the Wednesday night Gambrill ride had a decent turn out, 17 riders to start, down to 15 within the first 15 minutes. Myself, I had a few mechanical issues to start that led me turning the lead over to Mike. Light bracket issues and dropped chains but I got it sorted out and was able to enjoy the majority of the ride. Two other riders had flats so overall this was probably the slowest loop we've done so far but still a good time. Post ride pizza and beer at the brew pub because this seems to be the only place serving food late in the middle of the week. Not bad because the beer is usually good, but pizza is the only thing being served that late so you better like the pie or drink your meal. Saturday was my B-day so don't ya know I had to ride? A few friends showed up to help me celebrate by doing 20+ miles in the Watershed. It was sunny and around 60 degrees, what did I do to deserve this good fortune? Not all was perfect though. Problem was, we didn't know that they had a special two day deer season Jan. 5th and 6th. Jeez, I thought modern firearms season was over. Well, it is now but there were plenty of people out there on Saturday trying to get one last freezer full of venison. We soldiered on, bells blazing so as not to be mistaken for anything but human and we were polite and friendly to the hunters we saw. I generally stay out of the hunting areas during rifle season not only for my own safety but to give the hunters their own time in the woods since their season is short. But the die had been cast on this ride so I just went with the flow. Julie and some of the girls did their own ride and then a bunch of us went to that ol' so familiar place known as the brew pub. Sunday I was back out at the Shed with Tom from the Bicycle Escape and some of the guys he rides with regularly. We put in a few good hours of riding before slipping off of the mountain before the rain came in. By the time it hit full force we were eating Mexican and putting down tasty Margaritas. And speaking of the Bicycle Escape, if you are in Frederick and in need of single speed goods they stock a good selection of stuff and have just cataloged it online here. And of course the have plenty of non SS stuff too. There were a more rides in there since my last report but I don't recall the details. Ride overload perhaps, an illness I will glad suffer in the future too. Not sure if this weather pattern is due to global warming, but you've got to seize the day if you are having sunshine in your area. If not and you are somewhere that's been getting dumped on by heavy snow, well I hope you are getting some time on the snowboard/skis/snowshoes and making the most of that. Spring will be here soon enough and you'll be back on the bike.